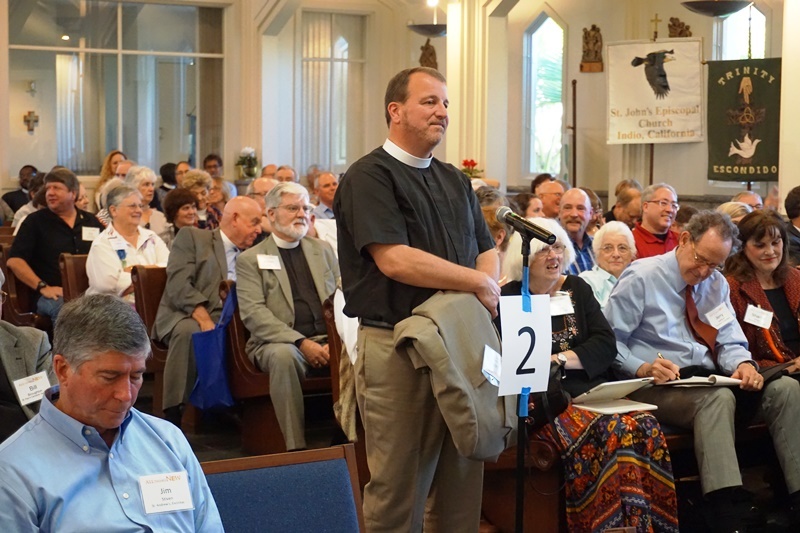 Resolutions for the 45th Annual Diocesan Convention are were due October 1. If you have questions, contact Keren Mondaca, 619-481-5454. The following hearing took place on November 6 at 2 p.m. Click here to view. Resolved, that the 45th Convention of the Episcopal Diocese of San Diego (“Diocese”) instruct the President at the Electing Convention expected to occur on February 2, 2019 to seat, with voice and vote, one additional delegate from each of three congregations (St. Luke’s, San Diego; All Souls’, San Diego; and St. James, La Jolla), in accord with the Average Sunday Attendance (“ASA”) reported on their parochial reports for 2017, now certified by the Diocese. EXPLANATION OF RESOLUTION: Title I, Canon 4.03 of our Diocesan Canons provides how many delegates each congregation shall have at conventions based upon the Average Sunday Attendance (“ASA”) in the “latest available annual parochial report.” Following the historical practice, in March of 2018, the Bishop’s Executive Assistant notified congregations how many delegates each should select for this convention. This notice was based on the parochial reports for 2016, which were at that time the most recent reports fully completed and certified. Canon 4.03 also provides that delegates serve from the time of the convention for which they are selected until the next convention, including any special conventions (such as our upcoming electing convention). The parochial reports for 2017 were complete and certified in May of 2018. Application of the ASA from these reports would result in each of the above-named congregations receiving one additional delegate. These congregations could certainly contend that Canon 4.03 should not be applied to their disadvantage. The Presider at the electing convention will be responsible for ruling on any dispute concerning seating of delegates. It is desirable to settle the issue described here in advance, so that affected congregations can plan accordingly. The Standing Committee recommends adopting this resolution to afford the maximum participation arguably supported by the canons. 1. 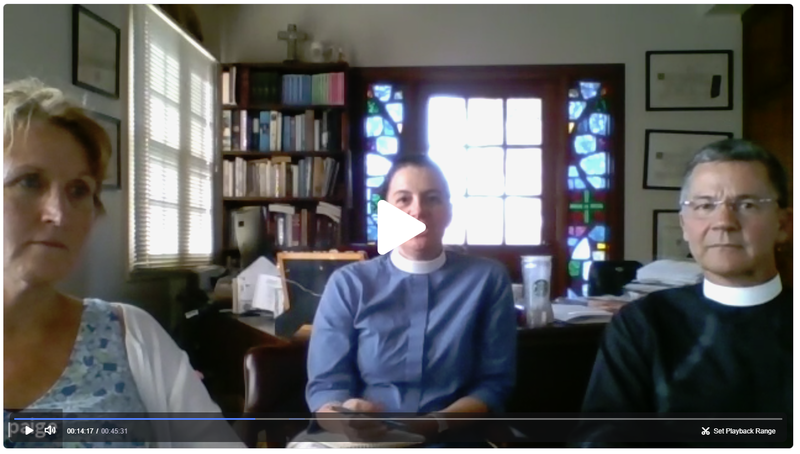 The establishment of a model program for education of leadership in Trauma-Informed Care in the context of clergy sexual misconduct, and development of a congregational educational curriculum on clergy sexual misconduct. 2. The formation of an interdisciplinary Compassionate Care Team to assume responsibility for trauma-informed care for the primary victim. 3. The formation of a Pastoral Response Team to guide congregational healing after a traumatic event. The Task Force to Oversee Creation of Training Materials (Resolution A048). The 44th Convention of the Episcopal Diocese of San Diego called for the formation of a task force to study the experience of victims who report clergy sexual misconduct; become educated on best practices for safeguarding these reporters; and issue recommendations to the Standing Committee, Executive Council and the 45th Convention. Resolution 17-04 charged the Task Force with making recommendations reflecting a trauma-informed approach to the care of reporting victims, both through the canonical reporting process, as well as in their home parish. The Task Force devoted ten months to study of this complex issue. Its research included diocesan-wide open invitations for past Complainants or others to confidentially share their experiences; hearing first-hand accounts of victims who have filed Title IV complaints, both in this diocese and elsewhere; interviews with other dioceses and parishes within other dioceses, focusing specifically on approaches that may have been successful, as well as failures; consultation with a psychologist experienced with trauma; exploration of the U.S. Navy’s model Sexual Assault Case Management Group, as well as extensive reading and debate. The Task Force has now submitted its report. The Findings of the Report reveal that we, in this diocese, are very far from “getting this right.” In this diocese, as elsewhere, retraumatization of victims is prevalent and systemic. Despite having very well-meaning people involved in the church response, we are causing significantly deeper harm to those who step forward to report. This finding is in contradiction to the statement, “A victim has a right to expect our faith communities to respond with the love and compassion of Christ,” which was affirmed by resolution at last year’s Convention. The Task Force has submitted its recommendations regarding education, the Compassionate Care Team and Pastoral Response Team. To be successful, all three must work in tandem. Approval of only one or two would ensure that victims continue to be retraumatized. The work of the Task Force and of this Diocesan Convention takes place in a context in which issues of sexual abuse, and the treatment of victims of sexual abuse is in the forefront. From the entertainment industry, to Silicon Valley, to academia and athletics, to the United States Armed Services, to our political life, to the Roman Catholic Church, industries and institutions are reckoning with these issues in very real and public ways. The world is watching, and these institutions and industries are, rightfully, being assessed publicly and broadly, as to whether or not the response is adequate, effective, and just. The Church, and our Episcopal Church, must seek to do nothing less than what is adequate, effective, and just, and in fact, as the Body of Christ, must seek to do more. Through the implementation of these recommendations, we will design a compassionate response that cares for the victims responsibly and holistically, in a trauma-informed manner, both during the Title IV process and in the aftermath as they heal from the trauma. At the same time, we will also be proactively helping to heal the impacted community. This is the response that truly promotes healing and reconciliation. This is what is required of the Body of Christ.